More than 850 people packed the National Conference Center ballroom this morning to highlight how hundreds of businesses and nonprofit organizations are giving back to Loudoun’s public schools. 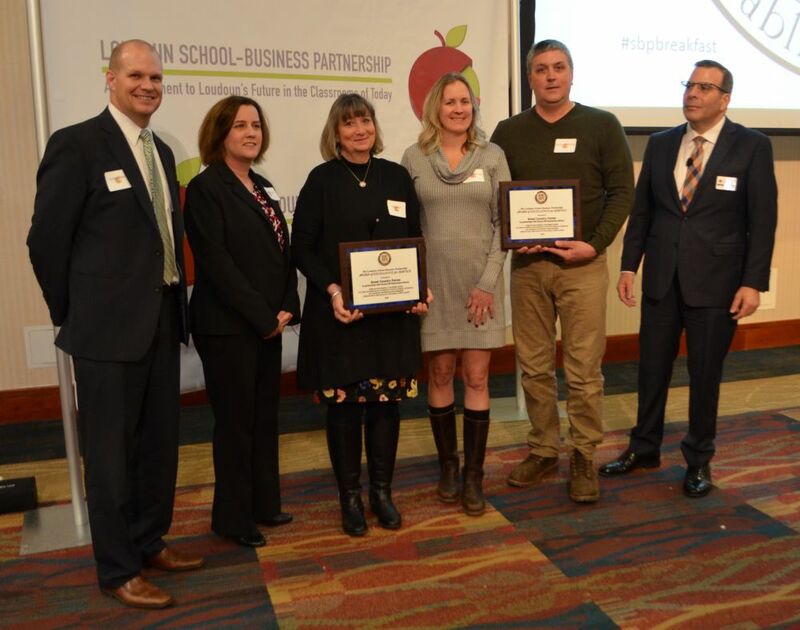 Partnerships between engineering firms and elementary schools, farms and middle schools, medical centers and high schools were just a few of the connections celebrated at the annual Loudoun School-Business Partnership Recognition Breakfast. Superintendent Eric Williams thanked the business leaders for giving of their time and resources to support the county’s 80,000 students and 90 public schools. It helps students learn beyond the walls of the classroom and facts in a textbook and actually take part in real-world problem solving. and United States Geospatial Intelligence Foundation’s partnership with Moorefield Station Elementary School: Foundation staff teaches students hands-on lessons to show how geometry is used in everyday life. (Watch a video on the partnership here.). Of the partnership between Boulder Crest Retreat and Round Hill Elementary, a Round Hill fifth-grader said he will never forget doing crafts with children of wounded veterans. Tom Sweitzer and Kim Tapper from the nonprofit music therapy organization A Place to Be received the Make a Difference Award for their work in the schools. They led the effort to create a musical called “A Will to Survive” and perform it free of charge at schools throughout the county. The production is named after William Robinson, a Loudoun Valley student who lost his life to suicide. It’s addresses stress, addiction, and depression, and is designed to teach acceptance and empathy. Sweitzer told those gathered in the huge ballroom that he recently witnessed the benefits of this relationship between his organization and the public schools. 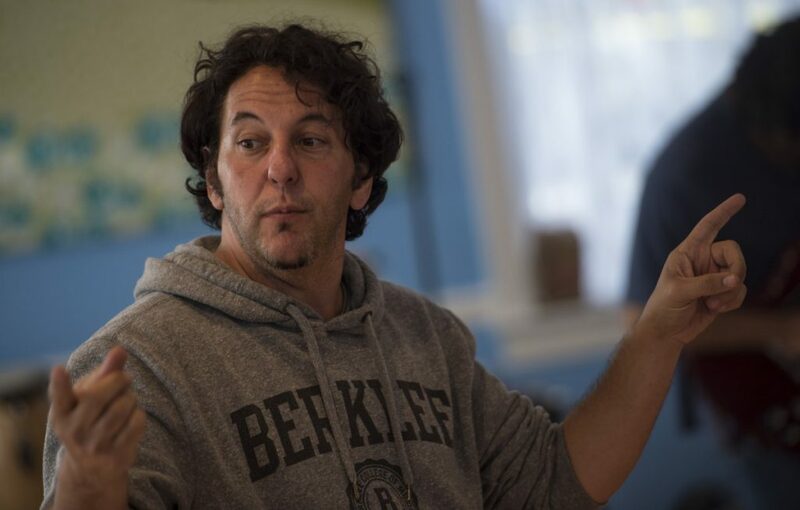 He was volunteering at Inova Loudoun Hospital’s psychiatric center and noticed a girl with a red bracelet on like the one the teen performers in “A Will to Survive” distributed. He asked where she got it, not disclosing that he was involved in the production. She said she’d seen the play at Heritage High School and, as she later considered suicide, one of the play’s songs called “Reach Out” came to mind. “So I decided to voluntarily check in to this hospital,” she told Sweitzer. Two other awards were given in recognition of those who support the schools. Apple Federal Credit Union won the Legacy Award, and Inova Health Systems CEO J. Knox Singleton won the J. Hamilton Lambert Exemplary Leadership in Education and Community Service Award. Singleton could not make it to the breakfast because he was attending the Inova Leadership Institute, but Stacey Metcalfe, the hospital’s director of Western Region Government and Community Relations and a member of the Loudoun School-Business Partnership Executive Council, accepted the award on his behalf.